Learn about the J1 Visa application process, including visa processing time, scheduling embassy appointments and registration requirements. Host companies cannot place trainees or interns in unskilled or casual labor positions or in positions that require or involve child care or elder care, or in any kind of position that involves patient care or contact. Now, here are some benefits of becoming a J1 intern or trainee! We hope you are more clear about the benefits and differences between these types of J1 visas! 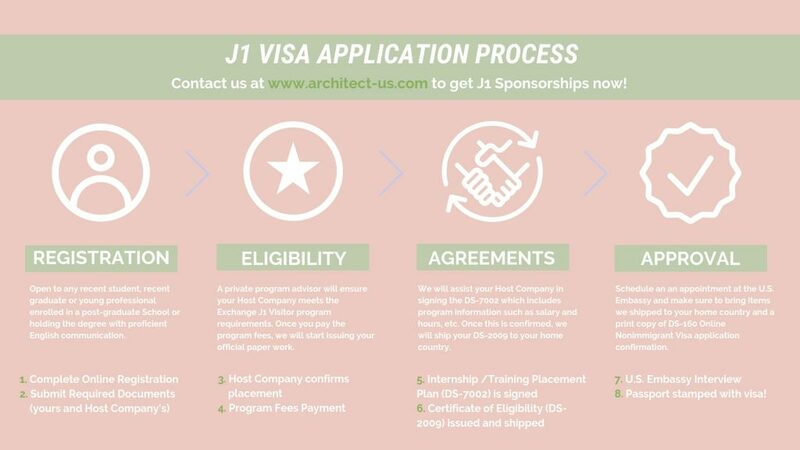 Now, if you are still curious and hoping to start your application process, please don't hesitate to contact Architect-US for J1 sponsorship! What you do during your interview is just as important as what you do after your interview. You want to make sure that you are polite, and that you follow-up with the company not only to show your interest, but to be proactive as well. American companies take great value in that! So here we leave you with the top 3 things we always recommend the candidates of our Career Training Program to do after an interview with any company: 1. Post-Interview Email Send a thank you email right after the interview with any firm. You want to make sure that you send it within 24 hours of the interview as well. That way your conversation with them is still fresh in their minds and they know of your interest with them. If you don’t know what to write in the post-interview email, make sure to check out this post detailing the four main things you should include. 2. Next Steps Depending on how the interview finished and how the conversation was concluded, you want to make sure that the next steps are done correctly. You should always ask for the next steps moving forward, in which they will probably give you an estimated time for a decision from them. You want to make sure that you don’t overwhelm your employer with lots of questions so pay attention to what they tell you and try to stick to that. 3. Alert References We know from experience that several firms like to call some of the references after the interview. So make sure that you alert your references and inform them that they might be receiving a call from an employer. You references are very important and you want to make sure that they are not getting cold-called. At this point, you can also let them know of anything that you might want them to stress in their recommendation. In order to begin your journey with Architect-US and so that we can begin helping you throughout the J-1 Visa application process, the most important thing is to first register in our program. That means that you have to make the decision between the J-1 Visa or Job+J-1 route, which ultimately differs in the “Job” part. In both alternatives we will guide you throughout every single step so that you can secure your Embassy Interview and finally have your Visa issued so that you can begin your adventure in the States. Most of our participants register in the Job+J1 program because we present them with many different opportunities from top companies in the U.S. looking to fill in a position and we are able to put them right in the front steps of those companies. So, after you’ve completed the first step which is Registration in our website and you’ve submitted you CV and Portfolio. A member of the Selection Committee will verify that you meet the requirements for the J-1 Visa and will also look through you CV and Portfolio and suggest changes which will make your work really stand out. Once you’ve become a member in our program and you have joined our pool of talents, you will be sent offers in the cities that you are interest in. We will always try to send you offers that best fit the specifics of what you are looking for (location, size, company mission, etc.) and wait for your reply to see if you’d like to be included in the selection process of those offers. It is once you’ve been interviewed by a company and received and offer letter that we begin with the next phase. Here a private program advisor will ensure that the company meets the requirements of the Exchange Visitor Program. That means that if necessary, an area rep will perform a site visit to make sure that the company is in a safe environment, and will provide you with the best experience possible during the duration of the program. At this point, once the company check out and everything has been approved, we will assist you in signing the DS-7009 in which information like salary, hours, goals, program plan, etc. will be included. Everything will be reviewed by members of our team and by the Department of State and once we receive the final approval, the DS-7009 will be shipped to your home country for you to sign. In these final steps, we will send you all of the information that you will need in order to confirm you Embassy Interview. That includes the items which we shipped to your home country and a print copy of the DS-160 Online non-immigrant visa application confirmation. Now you will be at the very end of the process, in which you will get your Visa and Passport stamped. Finally, you are good to go on your quest to learn from some of the best architects in the U.S. and get to apply your skills learned over your studies/career and apply them in them in a professional environment in the city of your dreams! 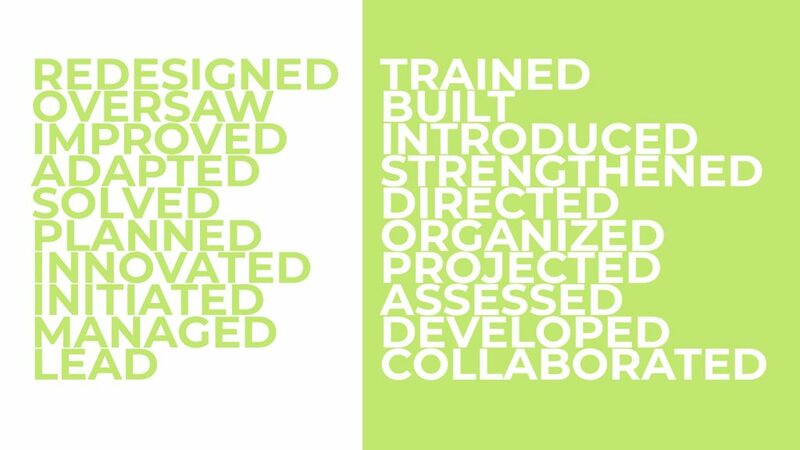 In your Resume, it is important that you include Action verbs that demonstrate you were able to accomplish, change, improve, or finish something in an impactful way. It has to be a word which demonstrates problem solving skills and the ability to reduce process inefficiencies. You have to take into account that your resume should fit in only one page, and not be overly text heavy. So, action verbs like these can make a short description of a specific task seem way more meaningful. Basically, it is a word that is able to paint a picture of the action that you are explaining and is able to show how you specifically participated in that role. If you need help with this make sure to let the Architect-US team, we’d be happy to help! Compensated Internship position Once you form part of the Architect-US Job+J1 program, we will be sending you exciting offers via which you have to respond to so that we know whether or not to include you in the process. Once we present your profile to the company are then in constant communication with them and keep you updated in the process. We always make sure that you position is adequately compensated for you qualifications and with the consideration of the market salary. Expert advice throughout the entirety of the process We provide you with tools and tips that will maximize the potential of your CV and Portfolio and help you with any questions that you may have along the way. We also give you recommendations that you may need given different company profiles and arrange interviews, calls, and any exchange that you may need with the prospective host company. J-1 Visa sponsorship application processing We cover the issuance and shipping of the DS-2019 Form and acceptance packet. We also provide you with guided instructions from the beginning of the process all the way to the scheduling of the embassy interview. Accident and Sickness Insurance This is a frequently asked question my many of our program applicants. So, it is good to know that we do provide you with insurance for the entirety of the program duration. Sevis fee There is a mandatory SEVIS fee of $180 which is for the online system used to maintain information on the J1 and J2 Visa holders. It is the Student and Exchange Visitor system operated by the U.S. Department of Homeland Security. Informative Dossier This includes information on how to open you bank account, finding housing, important information on the Social Security number, taxes, and other important information that will help you upon arrival in the States. 24h support During your stay you are provided with 24-hour emergency support in the case that you have been in accident or need assistance of any kind. English Interview There is a mandatory English interview which we must conduct as part of regulations. We test you ability and fluency in English to make sure that you English level is acceptable for the standards of the American office. Embassy/Consulate Fee You will have to pay a $160 application fee. Site Visit Every Host Company which has less than 25 employees or has less than 3 million dollars in revenue are requested to complete a site visit. Here they assess different criteria to make sure that the office provides the candidate with a professional environment, a structured training plan, ability to offer constant supervision, safety, the availability of housing and transportation, and many other aspects that ensure a safe and educative environment for you. DS-2019 Expedite Issuance Service This refers to a request for a new or extension of the DS-2019 Document in a shorter amount of time in the case of an emergency. Airfare tickets The airfare tickets to get you to the states will have to be covered by you. Cost of Living Before your departure we will provide you with helpful information on the costs of living and housing in your area. However, those costs will have to be covered by you. It is up to you to find the apartment of your choice and one which is in the price range that you are looking for. Nowadays it is very common for companies to directly ask you for what you expect to earn working for them. So it is a question that you need to bear in mind before going into an interview, otherwise, you can potentially miss out on a higher income. We understand that it can be very difficult for you to do this, discussing what your earnings should be with your interviewer is not easy, but it's not wrong if it is done correctly. You just have to make sure that you have done the correct research, and that you know what the appropriate compensation should be for someone with your skills and qualifications in a specific state. At Architect-US we provide you with guides on how to do this and help you throughout the process get the best offer possible. 1 Work on making a good presence At this point, you want to make sure you start off on the right foot. Remember that one of the questions which they will have in mind is: will I like working with this person? So, you want to make sure that you can level with the person that is hiring you. That way you have better chances when it comes down to negotiation. 2 Do you deserve it? They have to believe that you are worth hiring for the position! So, do everything that you can to sell yourself. Also, don’t feel bad about raising the salary, but make sure you don't exaggerate either! In our program, we will always do everything we can so that you receive salary commensurate with your experience level. 3 Think long term Remember that the initial salary is not everything. Many companies offer a probation period with the possibility for a salary raise after an "x" amount of time. So, make sure to take everything into consideration. Of course, life in the U.S. isn't cheap, so we know you want the highest offer, but remember that getting the experience at a top firm will build your resume and give you the credentials to negotiate higher salaries as in future contracts. 4 Make sure they know that you are interested Sometimes there are candidates that take interviews just to see what their options are and also to have more options on the table. While that is perfectly fine, make sure that the firm believes in your interest, otherwise, it may show, and they will not enter negotiation. 5 Competitive Salary Find out all you can prior to the interview about past employers and their projects so that you can see what gives you the competitive edge with them! 6 Keep a few options open Think about different salary options that you may have just so that you don’t limit yourself. Like re-negotiating after a probation period, doing reviews, personal days, work hours, really everything is on the table. You just have to take everything into consideration. 7 Stay Make sure you always get a “yes” or a reason “why not”. It is ok to ask for clarification. Also, you can always ask for more time to think about the offer that you received. 8 Don’t rush Never rush a negotiation. If you need your time to look over the details that is perfectly fine! Don’t feel pressured into accepting an offer which you don’t like. 9 Final answer Don’t agree on a salary after negotiation and go back in asking for more! However, every situation is different and depending on what was discussed that can change. As contracts take time to put together, you should try so that everything is discussed before hand, that way there is no miscommunication. Don't stress out too much! We are here to help you along the way. If you are reading this article we can probably make the conjecture that you are a little frustrated from reading hundreds and hundreds of job descriptions looking for the one that best suits what you are after. So, it is important that you know what to look for so that you can spot the highlights quickly to see if that job is a match to what you want. The team at Architect-US has made this guide to help you navigate through those job posts and so how to decipher quickly to find the dream job! 1. Job Description is key A job description has to dive into the responsibilities which will have to be performed by the employee, the purpose, and the summary of the tasks to be completed. Find the hidden details and most importantly, see if you can envision the working conditions from the text. 2. Finding important info Finding key words within the text of the job posting is a great tool to use to give you a good indication of what the job position looks like and also what the employer is looking for in the applicant. That means that you can look for clues that will help you tailor the application to what it is that they are looking for. Do keep in mind that sometimes recruiters and managers might use special words or phrases that are ultimately the most common words used in every application. So, make sure you find those which separate from the other applications you’ve seen. 3. How to know if you should apply? Make sure that you look at the application carefully and ask yourself if you fit the requirements you are after. By this we don’t want to limit you, because there are instances in which they will value other things that might make you a great addition to their team. The thing that you have to look out for is that if they are looking for something specific, such as a person with a certain level of proficiency in a software, or an X amount of years of experience in the field, you will want to be reasonably close to that. I wouldn’t expect to be hired to be hired as a junior for a position that says 9 years minimum working experience. 4. Room to grow Last but not least, try to envision yourself in that company. Do you see a future there? Is there room for you to grow at the company? If advancement is not explained in the job description, you can use the job tittle as a guide. That way you can see the level which you are applying to. You have to determine things like fitting into the company culture to determine if you really want the job. Don't worry!! If you research well and if you are organized with your job applications you will be alright! Who can register for the Architect-US Programs? However, the Job + J1 Visa Program is exclusively for Architects (Architecture, Interior Design, Landscape, etc.) due to the specialized network of Architect-US in finding opportunities. How can I register into the Architect-US Programs? Yes, initial registration in the J1 Visa Program and Job + J1 Visa Program is free, so sign up to receive detailed information about your eligibility, process and program costs. What is the standard processing time to get the J1 Visa? With Architect-US you can join the American Company that has offered you an Intern / Trainee program in 30 days from the time we receive all the required documents from the participant and the Host Company. This 1-month processing time includes all the stages: documentation validation, official documents issuance, Embassy appointment, getting the passport back stamped, and travel (depending on the J1 holder's plan). What is the shortest processing time to get the J1 Visa? The shortest time period to get the J1 Visa is around two weeks since the application has been submitted (since the documents from both the applicant and the Host Company have been received). The Expedited Service has an additional fee that has to be paid by the Intern / Trainee (or the Host Company if it wishes). However, this 2-week guarantee includes only the aspects of the process which are entirely under Architect-US control, and do not take into account possible delays of the Embassy appointment, delays in returning the passport or any participant travel arrangements. Can I change the dates of my Program after I have applied for the J1 Visa service? Yes, the international Intern / Trainee participant can change the dates of their J1 Program before they arrive in the USA, but they must inform Architect-US immediately in order to implement the necessary changes in SEVIS, as it must always reflect the actual situation. Is it possible to schedule an embassy appointment outside of my home country? Even though the Intern / Trainee can apply at the U.S. Embassy from any country in the world, we usually recommend that the participant applies in their country of permanent residence because that is where they can show strong ties to the country, and non-immigrant intent. Is it true that my passport needs to be valid for six months after the end of my program in the U.S.? In general, the Intern / Trainee needs to have their passport valid for six more months after the end of their J1 Visa program. However, the so-called "six-month club" allows the participants from certain countries to have their passports valid only for the time they stay in U.S. including a possible grace period. More information regarding the privileged countries is available on DOS website. As with any job, there are several things that you have to take into consideration before beginning your job hunt. Every single profession has its own important piece that has to stand out, but overall it is all a culmination of well-organized and strategized planning that will get you that much closer to the job you’ve been looking for. You can think of all of your documents, records, curriculum, portfolio, business card, basically everything as a team. One has more importance than the other but overall to be successful all of the functioning parts have to work together for the win; landing that job. If you are able to organize everything and give your self enough time to revise your work and adjust anything that can be improved and/or updated, all that comes next is effective strategizing. 1. Planning Make sure that you review your work thoroughly to see if anything that may be missing, or parts/sections that can be removed. Add any recent projects that you’ve been working on so that companies know that you’ve been active in the last months before applying. Think about everything that you need to do and set you’re a deadline and a set of daily goals that you will need to accomplish so that you meet that deadline, and stick to it!! Use spreadsheets to organize everything which you need to accomplish. 2. Research Make sure that you are well aware of the current job market so that you know what job positions are out there, and also so you can get a picture of what the salaries are in the area that you are interested in. Research the different platforms out there such as Archinect, Glassdoor, Coroflot, AIA Career Center, and the many others so that you get a wide overview of the companies that are hiring and what they are looking for in candidates. 3. Execution It is important that you send as many applications as you can. Similarly to the planning stage, try to set a minimum amount of applications that you will send on a daily basis. There more you send and the more your work is out there the more likely somebody will contact you for an interview. It really is a matter of quantity. Very importnant that you also make sure that all of your online profiles and LinkedIn are also up to date, this is very important.